There are many types of campaign and although we cover these briefly within this guide, the main purpose of this guide is to provide details relevant to all campaign types. There are many settings and components that apply to every campaign no matter the type or sub-type, we also provide some fundamental concepts and foundational information as to what campaigns are and how they work. Campaigns are containers that contain all account objects (other than the account itself). More than just acting as containers for ad groups, Campaigns have a number of properties and settings that determine the behaviour of the ad groups, keywords, ads and so forth contained within them. Every AdWords Account requires at least one campaign to operate, but you can have up to 10,000 campaigns should you require them. The name campaign comes from traditional marketing terminology ‘marketing campaign’, as such you will typically have campaigns designed for a specific purpose. The purpose of the campaign is largely defined by the type of campaign and sub-type of campaign. These can be narrow and focused in a single area such as advertising YouTube videos, or broader allow many types of ads across more than one network. AdWords campaigns are the second tier in the hierarchy; they sit underneath the ‘Account’ and contain all other components. 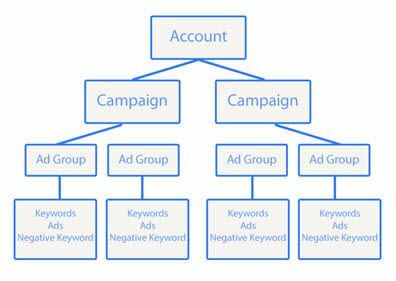 The image below shows the structure of an AdWords account and where Campaigns sit within that structure. Some settings can be adjusted at the campaign, ad group or targeting level and in this case typically the priority is granted from the bottom up in the hierarchy (the most granular setting). So if a mobile bid adjustment is set at both the ad group and campaign level, the adjustment at the ad group level will be used. Below we discuss each of the components of an AdWords campaign, we discuss in more depth some of these components in greater detail in other articles where stated. Some properties are set only at the campaign level, and these flow down to everything contained in the campaign. However, where settings exist throughout the campaign hierarchy (so campaign level, ad group level and keyword level) it is always the setting of the lowest level that takes priority. For example a mobile bid adjustment set at campaign level will be overridden by a mobile bid adjustment of an ad group within that campaign. The number of locations a setting or property can be added can cause problems if not applied consistently and logically throughout the account. This is where you can name your campaigns. Naming conventions vary and many organisations will have their own already in place. To a large extent, common sense dictates what campaigns should be named; naming them something relevant and descriptive helps you identify it more easily. This will depend on existing account structure and potential for future expansion. Very small accounts with a few campaigns do not need complex naming conventions. Larger accounts with Search and Display campaigns, geographical and non-geographical campaigns, different target languages and so forth will need something more comprehensive. Naming structures should be logical and reflect account structure. IN the above example we show first the network the campaign uses, often you need only name the network if it’s not the most common one used in the account. Second the name of the product or service the campaign primarily targets. Thirdly the match type of the keywords in the campaign is detailed here. When looking at data online, being able to quickly see that the campaign is Search network, about a specific product and broad match gives you a good idea of what is good or bad data. There are several campaign types available, we run through the options here, but we cover each of these in more detail in other articles. Choosing this option enables you to target keywords in the same way as you do on the search network but Google uses an automated bidding system to manage select display network advertising. For all intents and purposes this is managed in the same way as Search Only campaigns. This is intended more for newer users with less experience. Read more about Search Network with Display Select Campaigns. This allows advertising on both Search and Display networks in a single campaign. It is often must more efficient and better practice to keep campaigns split into different networks rather than combining them. Read more about Search & Display Networks Campaigns. This is what most people see as advertising on Google, it connects users (or searchers) with relevant ads at the point that they are searching. This is incredibly powerful compared to almost all other advertising in that you only market to people when they are actively searching for your products or services. Read more about Search Network Campaigns. The display network works quite differently to the Search network, although still possible to target keywords, people are not actively searching for them when they see your ad. Therein lies the biggest difference; this impacts Click Through Rates (CTR) and conversion rates due to the target audience being less relevant overall. Consequently, the Display Network will typically be cheaper than the Search Network due to the reduced relevance of the target audience. Read more about Display Network Campaigns. Creating a shopping campaign allows you to show detailed information on your products before they are clicked. To use this you will be required to have a Merchant Centre account and provide a feed of your products to Google. This is managed very differently to standard Search Network Campaigns, allowing for Product Listing Ads (PLA’s) as clickable ads in Google’s Network. Read more about Shopping Network Campaigns. Both Display and Search mobile app installs are designed to generate more installs of your app on mobile devices. This manages the aim of getting more app installs by advertising on the Display network. This manages the aim of getting more app installs by advertising on the Search network. Read more about App Install Campaigns. Expressed as a value between -90% and +300% this adjusts the existing bids within the campaign by this amount for mobile devices. This will be overridden by mobile bid adjustments at ad group level. It is also possible to add a mobile bid adjustment of -100% which will prevent the campaign from receiving mobile traffic. This is a fairly crude way of managing mobile traffic, and it can get very complicated when you try to factor in CPA or ROI targets determining bids. That said, it does remain the only way to manage mobile traffic down or up. 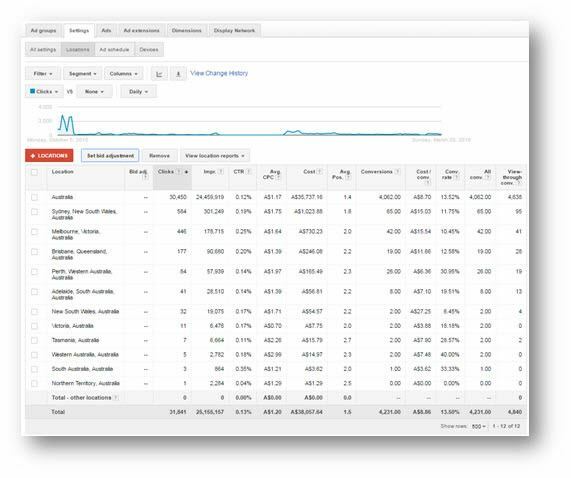 The image above shows in AdWords where you can see data for the devices and also adjust the mobile bid once you have a campaign selected. The image above shows that you can target devices based on operating systems and versions, in addition to carriers by region. These are quite advanced options and will require data and analysis to support specifying settings here. Unless you are aware of accessibility limitations of your website, in terms of not rendering properly on certain operating systems; this is not a common place to change settings from default. Bid strategies are dependent upon the campaign type and sub type, please refer to campaign specific guides for more information on this, or read our guide to bid strategies. The name says it all, campaigns that are ‘enabled’ are essentially live campaigns actively spending budget on Clicks. Enabled campaigns can have paused or removed ad groups and keywords that will not trigger ads or incur costs. This setting does not override the settings of ad groups and keywords contained in it. Campaigns that are ‘paused’ are not live / enabled until they are set to be ‘enabled’. These will not spend budget and neither will any ad group contained therein. Removed campaigns are campaigns that have been deleted; they still appear in the account but are greyed out. These will not spend budget and neither will any ad group contained therein. ‘Budget’ refers to daily budgets, so a budget of $10 in December will cost you a maximum of $310 (31 days x $10 Budget Per Day). Consequently if you would like to set a monthly budget of $5,000, divide $5,000 by the number of days in the month to get the budget. This is very important to understand because if you enter a monthly budget into this field and don’t check on the campaign for a day, you will have spent your monthly budget in that day. On any single day your budget can be exceeded by up to 20% but the daily budget on another day will be capped to keep the average budget at what you have set it to. This is date you would like the campaign to start on, typically you can leave this field as is unless you want to have a campaign go live at some point in the future. The end date refers to the last day you want the campaign to run on, after which it will be turned off. Ad rotation determines that way in which ads are shown where more than one ad exists in an ad group. We cover ads in more detail in another article but there are a lot of very good reasons to have more than one ad in any ad group. This setting determines how the delivery of these ads is to be handled. For example if you have 2 ads in an ad group, should they be shown 50% of the time each or should you allow Google to control which ad is shown? Google and optimise for conversions… On a new campaign with no historic data, you may want to split test ads for a while before handing control over to an algorithm. Optimising for Clicks means that Google will show ads that are more likely to garner Clicks than other ads, primarily using the CTR history of the ads to determine this. If your aim is to get as many Clicks as possible, this may be a good option for you. You may receive fewer Conversions as a result of this. Because Google will not show some ads most of the time, split testing is less relevant as often one or several ads receive too few impressions to split test. If conversions are the driving goal behind your SEM strategy, whether its ROI, CPA, or simply more conversions = better, this may be suitable for you. Google will serve the ad most likely to convert the majority of the time. You may receive fewer Clicks as a result of this. Rotating ads evenly will allow ads with lower CTR or conversion rates to show as often as higher performing ads. This will run for a period of 90 days and will then automatically change to ‘optimise for clicks’ unless you are using enhanced CPC or conversion optimiser in which case it will default to ‘optimise for conversions’. Rotating ads indefinitely will have the same effect as rotating evenly but it will not change automatically after 90 days. Meaning that no matter an ads performance it will show evenly until the campaign ends. If you are performing MVT (Multi-Variant Testing) or Split Testing, this is the option for you… Data will be roughly evenly spread between all ads and thus applying statistical significance formulas to the data will allow you determine what ads are performing better. Show ads evenly over time… This will try and spread your budget out evenly over the whole day, so that you get clicks throughout the whole day. This is the default setting and is typically used on any campaign where budgets are being reached. Tis is important to understand, because in AdWords you can look at the performance of campaigns by hour of the day, this will become important when creating ad schedules. Identifying when you are most likely to convert traffic, pay more or less for it, get the best CTR, etc is pivotal to creating well-optimised campaigns. Hence, having your ads show all day is a pre-requisite for making this decision. Show ads as quickly as possible… This will spend your budget as fast as possible, which can be useful if you are not reaching your budget limit each day. This will only be available if your campaign has ‘all features enabled’ when you first built the campaign. Campaigns limited by budget will often run out of budget in the morning if this delivery method is used. Consequently this is not advised for most advertisers. Ad Scheduling allows you to prevent ads from showing at specific times of the day or only within certain hours and on days of the week. This is particularly useful if your business is unable to respond outside of office hours, having your ads running while you are incapable of responding to requests is a waste of your money! For example you can set a campaign to run only between 9am and 5:30pm Monday to Friday. It is also possible to set bid adjustments during specific hours or times or days of the week. For example you can up bid your campaigns CPC’s by 25% between 3pm and 5pm but then reduce CPCs by 30% after 6pm until midnight. Or you could adjust all bids by +10% on Tuesdays and -10% on Wednesdays, if you have a reason to do so. This provides a nice visual interface that shows you in blue lines when you have scheduling setup. The image below is what you would see if you scroll down the same page from which the screenshot above is taken from. Here you can see the performance data for each of these scheduling times or create a new schedule. From here you can set times and the bid adjustment for those times as well as see historical data. This feature enables you to maximise account performance when it is most beneficial to do so. We discuss this in more depth in an article on Ad Scheduling. 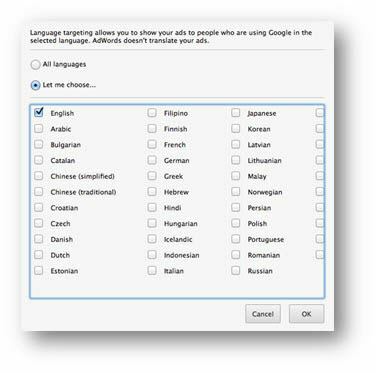 Google provide support for languages, so you can target people who speak the language used in your ads. For example if you work in the UK but are targeting Germans or German speaking people, you can specify this here. This is determined by the language the user uses when searching. Below is a screenshot of what these options look like in AdWords Editor. Location options allow you to specify in which location you want your ads to show. This is determined largely by the IP address of the computer being used to search with or access sites within the Google network. It may also use profile information from logged-in users. Locations can be countries, counties, states, cities and regions within cities. There area limited number of locations available depending on the ability for Google to determine the location and the volume of searches associated with it. This is not 100% accurate but is good enough to work with, more so for bigger regions. From here you can set the location bid adjustment by entering a value clicking the blue ‘make changes’ button. As a note; choosing only small regions will limit the exposure your ads have. There are ways of targeting users based on interest and location. For example, if you want to target users in Sydney, do they have to by physically located there or specifically using the word ‘Sydney’ within their search? These options allow you to specify how Google’s serves / delivers your ads and when based on location. This is the default and recommended option. For example; if you are advertising taxis in Sydney… if someone were in Sydney and searching for a taxi, your ads could show if they just searched for ‘taxi’, but they could also show if someone in Perth searched for ‘Sydney taxis’. Ads will only be shown if the person searching is located within the target location, so to continue the example above, if someone in Perth search for ‘Sydney taxis’ your ads would not show. The actual location of the searcher is ignored in tis option. Continuing the examples above, if a person in Perth searched for ‘Sydney taxis’ the ad would show, but someone in Sydney who searched for ‘taxis’ would not be served one of your ads. This will exclude people based on where they are and what they search for… Continuing the example in the above section, but with the amendment that you do not want to have ads show for people in Newcastle. Is someone in Newcastle searches for ‘Newcastle taxis’ or just ‘taxis’ your ads will not be triggered. Ads will still be triggered if the person searched for ‘Sydney taxis’. This exclusion method will exclude anyone from the specified location from seeing your ads regardless of what they search for. IP or ‘Internet Protocol’ are the address of a computer or a proxy server (through which computers access the internet) on the internet… For example, if you work in an office, it is likely that everyone in that office when access the internet will have the same IP address, as you are all accessing the net through a single computer (proxy server). So, if you don’t want your ads to show to people in your own office or any other known computer IP or Network IP, you can exclude that here. This can prevent unwanted impressions and clicks, or if you notice activity from an IP address that seems suspicious, you could exclude that IP address also. Labels are a simple way of tagging campaigns with relevant information, for example you could add the label “blue dresses” to a campaign that advertises blue dresses. Equally you could add labels that describe anything about the campaign, this can be filtered in AdWords (using filters) or once exported into a spreadsheet you can use these for SUMIF, VLOOKUP, COUNTIF formulas, etc. Essentially providing customisable segmentation criteria for your campaigns. AdWords already provides functionality to filter campaigns by network, device, and criteria such as minimum Clicks or Conversions, so labels are only relevant when adding another criterion with which to filter or segment data.